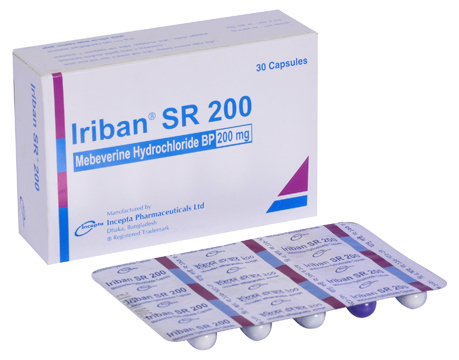 Iriban 135 tablet: Each tablet contains Mebeverine Hydrochloride BP 135 mg.
Iriban SR 200 capsule: Each SR capsule contains Mebeverine Hydrochloride BP 200 mg.
Iriban is a musculotropic antispasmodic agent used to relieve cramps or spasms of the stomach and intestine (gut). It is particularly useful in treating irritable bowel syndrome (IBS) and similar conditions. It works by relaxing the muscles and helping restore the normal movement of the gut. 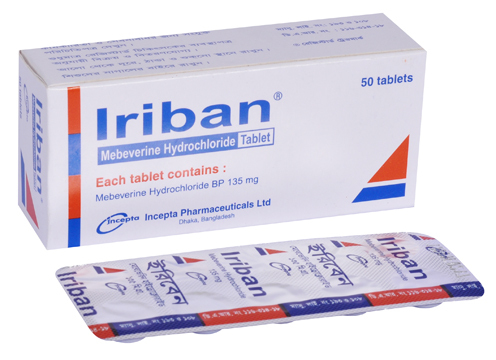 Iriban is most effective when taken 20 minutes before meals. After several weeks when the desired effect has been obtained, the dosage may be gradually reduced. *Missed dose: If a dose of this medicine is missed, that should be taken as soon as possible. However, if it is almost time for the next dose, then skip the missed dose and the regular dosing schedule should be maintained. Dose should not be doubled at the same time to compensate the missed dose. Generally Mebeverine is well tolerated. However, few side-effects like skin rash, urticaria and angioedema may appear. Caution should be exercised in porphyria or allergic reaction to this or any other medicine of this group. No teratogenicity has been shown in animal experiments. However, the usual precautions concerning the administration of any drug during pregnancy should be exercised. Mebeverine does not excrete in the breast milk after administering the therapeutic dose. Mebeverine is not recommended in children under 10 years.